The ninth annual Manchester mod weekender details have just been announced. 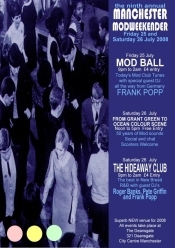 Taking place over the weekend of Friday the 25th and Saturday the 26th of July 2008, the popular weekender (also known as "Modchester") is bought to you by The Hideaway gang of Neil Henderson, Mike Warburton and Paul Welsby. This years event is in a brand new venue, but expect the usual first-class mix of R&B and early soul played on original 45s. The Hideaway Club evening do, 9pm-2am, £4 entry. Guest DJs Roger Banks, Pete Griffin (Boogaloo Radio), and Frank Popp. All events @ The Deansgate, 321 Deansgate, Manchester, M3 4LQ. For more on the weekend visit the website here .